Melt butter in a medium-size frying pan; add potatoes and shallots and sauté until potatoes are brown. Add dill, wine and salt. Stir eggs and milk into potato mixture. Brush a small amount of olive oil between the frittata and the sides of pan. Cook until golden on the bottom; flip and cook until frittata is firm to the touch. 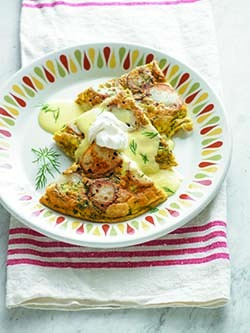 Flip onto serving plate; top with hollandaise sauce and a dollop of Darigold sour cream. Hollandaise: In a metal mixing bowl, add egg yolks, lemon juice, kosher salt, hot sauce and white wine. Stir and place over boiling water in a double boiler. Stir mixture at a slow to medium pace at first; gradually speed up as mixture begins to warm to prevent cooking on the sides of the bowl. (If necessary, remove top pan from double boiler). Keep stirring until soft peaks form; pour into a mixing bowl. Using an electric mixer on medium-high speed, slowly add clarified butter to the egg mixture. Periodically add warm water to keep the hollandaise from becoming too thick. Taste and adjust flavor as needed. *To make clarified butter, heat butter in a saucepan over medium-low heat until melted. Remove from heat and set aside to allow solids to sink to the bottom of the pan. Skim foam from top and discard. Pour off clarified butter and discard remaining milk solids and water.